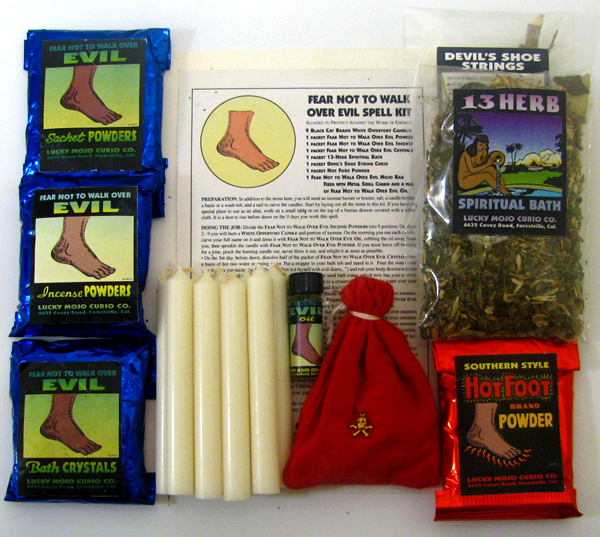 Fear Not To Walk Over Evil spiritual supplies are believed to protect from any tricks that have been laid down around one. Lucky Mojo Southern style Mojo Bags are made with genuine roots and herbs. Also called Jomos, Conjure Hands, and Trick Bags, they are generally carried on the person. Packaged with full instructions and 1 dram vial of Fear Not To Walk Over Evil Dressing Oil. Lucky Mojo Triple Strength Mojo Bags -- also called Jomos, Conjure Hands, and Trick Bags -- are generally carried on the person. They contain more costly and rarer ingredients for added power. Packaged with full instructions and 1 dram vial of Fear Not To Walk Over Evil Dressing Oil.